It was a simple enough request. 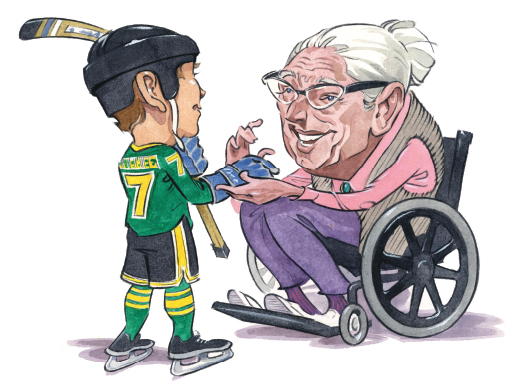 Could our Bantam boys swing by a nursing home during a tournament in Northern New York, to visit an avid hockey fan? The hockey aficionado with a long love affair with the fastest game on earth could no longer travel to a rink. She missed the frenetic pace, the end-to-end action, the crunching body checks and the passionate cheering from the stands. Was there any chance our boys could bring the game to her? Without hesitation, the boys were all in and when our jersey-clad teens proudly walked into her sterile, quiet room. It turned out that it wasn't quiet for long. Hockey quickly took over the room and the conversation. The N.Y. Rangers, Gordie Howe, Stanley Cup predictions were all part of the non-stop banter. Before their goodbyes, she learned all of the boys' names, their positions and favorite teams. Perhaps they didn't know just how much that visit meant to her, but we parents knew that simple act of kindness was an important character-building experience, which was reinforced by the note from the aged fan thanking the boys for stirring up "loads of memories." Building healthy, active communities through hockey is what drives suburban Chicago hockey coach Charice Wilczynski. She's organized the girls at the Glacier Ice Arena to raise money to donate hockey equipment and school supplies to low-income families. They've taught hockey moms how to skate and held clinics for Girl Scouts to encourage them to overcome fears and try something new. "In a community that is so tight-knit and loving, service is such an important part of youth hockey," Wilczynski says. "It is so rewarding for young children to learn how to enhance and empower the lives of other children and families by donating their time and efforts for a greater cause. "It is my greatest hope that I will lead the next generation to become inspired about the passion of service to others." Whether it's mentoring younger kids, ringing the bell for the Salvation Army, collecting food for the local pantry, or visiting a hockey fan in a nursing home, giving back to the community should be the goal for all of our young athletes. The on-ice skills developed during our children's playing days will only take them so far. But the life lessons they learn and character instilled in them will last a lifetime. Christie Casciano Burns is a hockey mom in Syracuse, N.Y. She is also the author of two books, "The Puck Hog" and "Haunted Hockey in Lake Placid." Bobby Rodrigue never played organized hockey at a high level. However, he did spend plenty of time on the ice growing up New Hampshire. Rodrigue's love of the game was instilled from a young age, and it remains as strong as ever. For the past 18 years, he has coached nearly every level of hockey while also helping teach other coaches in his area. The Keene, N.H., native's coaching career began when a college friend asked him to help coach a youth team. From there, he has worked with the New Hampshire Amateur Hockey Association in several roles, and has spent the past seven years as a coaching education instructor. He also helped start at club hockey team at Keene State. All Rodrigue's hard work was recognized by the New England District, which presented him with the first-ever Bob O'Connor award. Named in honor of the long-time USA Hockey National Coach-in-Chief, the award is presented to the coach who shares O'Connor's passion for the game. "I love the kids I coach," Rodrigue says. "We really have a lot of fun with our guys and take a lot of pride in seeing them graduate and be successful."